Cover photo by B. Minier & S. Berland. Musicians play to be together. To take their ears for a ride into other territories. To change places without prejudging too much what they might discover – other than themselves. Perhaps the one salutary challenge that might, at the end of the day, justify taking up instruments, like others take up arms. There is no doubt that, in this respect, the Free Unfold Trio has proven to be a worthy unit of soldiers of the shadows; one that, however, favours to the violence of defeated bodies, the uncompromising understatement of uneven progressions. 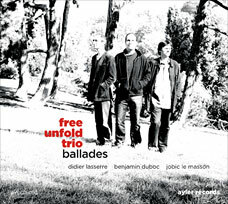 Benjamin Duboc, Didier Lasserre and Jobic Le Masson venture, and we with them, where many would instead turn round and go back: to the edge of the unknown, to secret places where an underlying depth permeates every gesture; where it feels good to lose oneself now and again. Ballads, therefore, are what it’s about this time around, following the eponymous début album released in 2006 on the highly respected Bordeaux-based Amor Fati label. On the razor’s edge, in the open air, wandering about between silence and what’s unplayed; producing vacant tones like so many quiverings of time. Four stretched out ballads, their melodies in dotted lines, as if diffracted, of dazzling brightness – gleaming seen as an art form.